No No! It's step step PIVOT! Do you WANT to piss off the volcano god!? No no, Mr. Lizard, a little more to the right. Thaaaats it. no, no, no, you're not listening! the rocks go here godammit! Don't do it , Mikey! Your life's not a total train-wreck! Come on down off the ledge, man! Hell yeah I can teach you the hula! 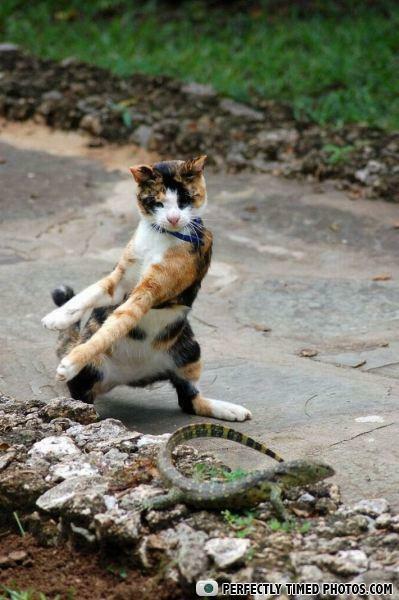 That cat is either being very courteous, or preparing to KUNG FU FIGHT! "Crouching Tiger, Hidden Dragon" after some budget cuts. I'll give you a "HI-YAH!" and a "WOO-CHA!" and we'll see who's more powerful! Did you see them? My boots are THIS big! Look I can do the robot- dance!!! "chop low, Rob Lowe, Chad Lowe." Did you see this moves? A wild Meowth has appeared! It's just a jump to the left... and a step to the riiiiiiight! I always knew David Carradine would be reincarnated! KUNG-FU!